Award Winning magician Alex Michael is Cilftons top childrens magician and entertainer. Every year he performs at birthday parties and celebrations in the Clifton Area. His magic show is aimed at all ages and last for 40 minutes. There is lots of fun and interaction and lots of magic. Be it a small hall or even in a house this is no problem for Alex Michael. Alex also performs school shows at nursery and primary Schools. These are all real reactions to Alex’s magic which are guaranteed at all parties. All guests will be amused and completely blown away, which is why Alex is one of the most in demand magicians not only in Clifton but in the UK. As you can see from his website http://www.alexmagic.co.uk there is a page of great testimonials from people who have witnessed and loved Alex’s magic. You can also see in depth detail about the party packages offered on the ‘childrens’ tab. This includes the magic show, the mini disco and games and the face painting all depending on what sort of party you are having. All parties are aimed at 3 yr old children all the way up to adult and are tailored to fit the age demographioc. There is a contact form on the website. If you fill this in with an e-mail address and your party date etc Alex will get back to you with a quote and any further details within a day. 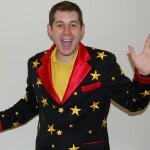 Why not book Magician Clifton Nottingham – Children’s Entertainer for a super childrens party? Just for peace of mind, Alex is fully CRB checked and fully insured for the amount of 10 million pounds through Equity, so there is nothing to worry about when booking him.